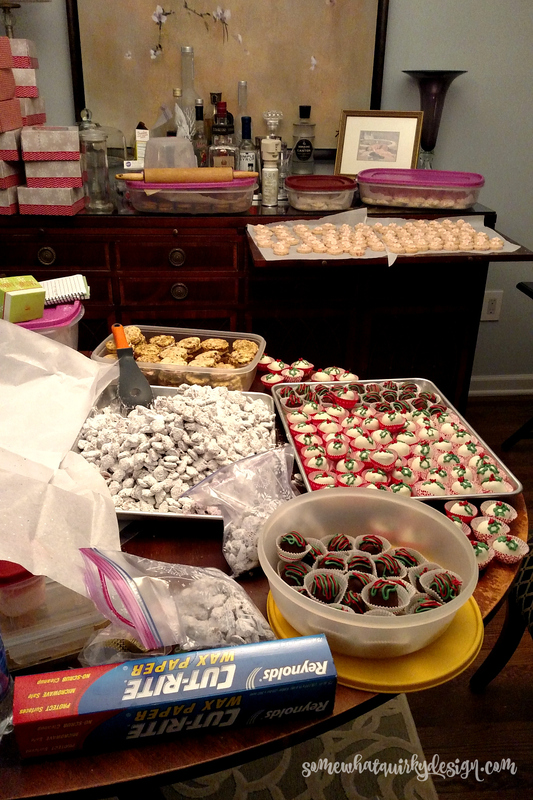 Over the weekend my friend, Jennifer, and I did our Christmas baking. This year I had seen several recipes on the Better Homes & Gardens website that I thought would be worth trying out. We tried 4 of their recipes with varying success and I thought I would do a little "review" of the recipes. We always make Oreo Truffles (the white ones in the picture) because they are a perennial favorite. I thought both Jennifer and Mr. Quirky would be a big fan of these because, well, they are chocolate chip cookie dough. They were easy to make and looked good (chocolate covered truffles in picture) but . . . TOO MUCH CHOCOLATE. The recipe calls for a full cup of mini-chips. In my somewhat expert opinion 1/2 cup would be better. You have to be able to taste cookie dough to make it recognizable as a cookie dough truffle. The recipe doesn't add salt either. I added a smidge of salt just because it seemed wrong not to. It was hard to tell if it was a good idea, because there was just too much chocolate. I could tell this before I rolled them up and should have thought to add another recipe of dough to them. But I did not. I will try making these again because theoretically they should be delicious and I'm determined to make it so! I mean they are chocolate. chip. cookie. dough. I LOVED this cookie. 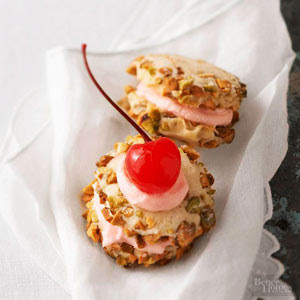 It is basically a pistachio sandie (like a pecan sandie, except with pistachios) with a bit of cherry butter cream in between. We didn't mess with the little blob of icing and the cherry on top. But they are pretty cookies, look festive, and taste fantastic. 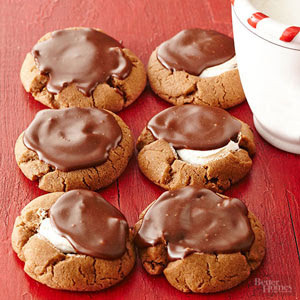 When making sandwich cookies it is easier if you use a cookie scoop - like the one I have on my Bakers Gift Guide. This cookie is pretty dang tasty. Jennifer and I both wanted a little more frosting on the cookie. But don't worry, this recipe for frosting is about enough for a whole cake! So if you're going to do the little rosette in the center thing you could probably make 1/2 recipe of frosting. We made some 2" cookies and some 1.5" cookies. The 1.5" cookies were cuter. And here's a tip: When chopping candied cherries coat your chopping surface with flour. Coat your SHARP knife with flour. Sprinkle flour over the cherries. Start chopping. Keep sprinkling flour/chopping/sprinkling flour/chopping until the cherries are broken up into very small bits. 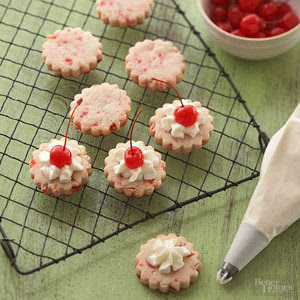 You may want to short the flour in the recipe a bit to make up for this flour that is all over the cherries. The frosting recipe calls for a Tbsp of cherry liqueur and says it's optional. So if you want this frosting - which is called Cherry Almond Frosting but has no almond flavoring, and makes the cherry optional - to taste like something besides plain cream cheese frosting, you need to add some marischino cherry juice or some cherry liqueur for flavoring. We used cherry juice that was left over from the Cherry Pistachio Cremes. We saw these cookies on Facebook the night before we were going to be baking. This is one of those weird recipes made from things you might not imagine that actually turns out. They are NOT fine pastry by any means, but they are chewy and lemony and I we liked them. Tip: use two spoons - one to scoop out a tablespoon or so of dough - and one to scrape the dough off over a bowl of powdered sugar. Roll the ball gently around in the sugar until it is covered and place on the cookie sheet. (If you wait to touch the dough with your fingers until it is covered with sugar, you won't have a problem with sticky dough.) Don't tap off extra sugar. 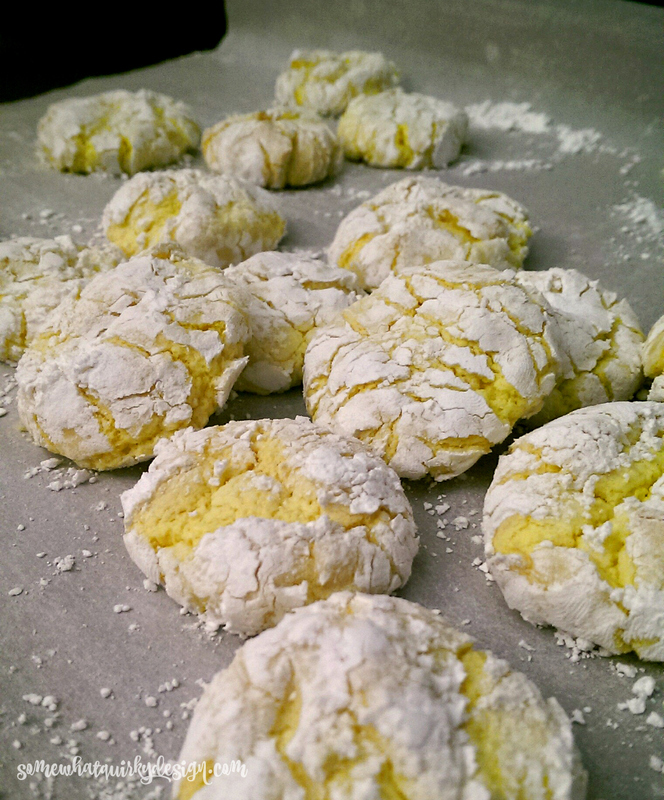 The more you leave on the prettier the crinkles will be. This may be the last time you hear from me before Christmas. At best it will be hit or miss over the next few weeks. If you aren't tired of Christmas cookies yet you might want to check these out - they all come highly recommended by the expert - ME!